So, the winter of 1950 found us all staying with a friend’s family in a small Southern California desert town. Not the rich and beautiful part, but the dirt road, snowed in, wood stove outback of the Morongo Valley. There was no telephone or reliable transportation. I was only four years old, so I have no idea why Mother moved there with no jobs available within fifty miles, any direction – and she never told us. The people we stayed with were living on a small pension and he was dying of lung cancer. Mother had $138. a month in Social Security Survivor’s benefit. Everybody had big troubles, make no mistake. Some of this I remember myself, and much is remembered because we talked about this period so often, but I didn’t really understand any of it at the time, of course. I knew we were cold much of the time and seldom had enough to eat, but I don’t feel “damaged” or “traumatized” by any of it. Much the opposite is true. I know what it is to be cold, hungry and homeless. I remember that sometimes and thank God for all my blessings. We had each other and lots of love. We didn’t know poverty was supposed to scar us for life. Christmas Eve came and we put up what decorations we had. (People didn’t ordinarily start to decorate for Christmas after Thanksgiving dinner in those days.) 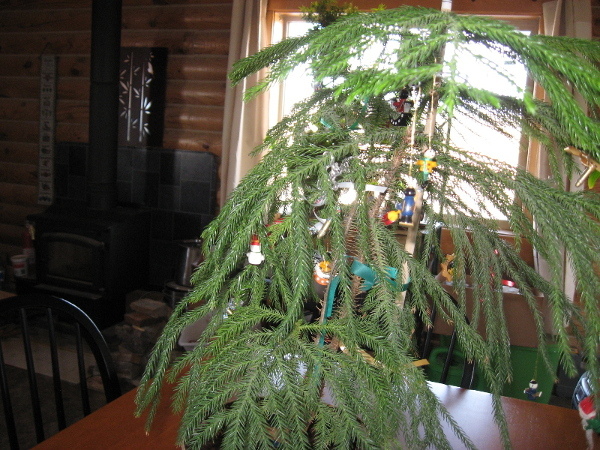 We had a branch of creosote bush for a “tree,” and there was one, small, handmade gift for each child under it. Soon wonderful smells came from the kitchen, and when we gathered for supper we were all surprised to learn that the only thing on the table was a large bowl of bread pudding. In later years my mother often told us how she and Virginia mixed together the last remaining bread, milk, eggs and sugar with a few raisins and some cinnamon. They put it into the oven with a prayer, and we said our usual prayer of thanks before we ate it. Only the adults knew that those were the last morsels of food left in the house and that none of them had any idea when or how they would be able to get anything else until the next pension check came in on the first. I can only imagine their agony – and their faith. Christmas morning broke clear and very cold. The snow wasn’t deep, but it stretched unbroken for many miles in every direction. We certainly didn’t anticipate company, but up the road came the county snowplow with a lone blue car behind it. The county never plowed the road by our house, so it was a mystery until the car pulled into our driveway. Out popped Virginia’s mother! She had shamed the plowman into making a path for her, and he helped her unload boxes of groceries and other things. The children were too busy to notice, however, because we each had a wonderful felt stocking full of nuts, candy and a few small toys. Then, at the very bottom in the toe, was a huge shining orange! Those were worth their weight in gold then and had been very rare in our lives to that point. I can’t begin to tell you what it meant to us as we jealously watched our orange peeled and then savored each drop of the golden fruit. From that date, Christmas has been a most blessed day. Mother went on to work hard, earning a living for her family. She made sure, by what magic I’ll never know, to have at least one big and beautiful orange in our stockings each year from then on. She told us it was to remind us of the past so that we would appreciate our lives and all the blessings we had. She made sure we never forgot to plan our Holy Day with others in mind. There was always another place at our table, a few warm clothes to “spare,” a bed on the couch, or just the human touch of hugs and clasped hands for someone in need. She remained active in AA, and sponsored many a man and woman to health and life. Nobody ever left our home hungry, unclothed, uncomforted or unloved unless they wanted it that way. This entry was posted in Mama's Rants and tagged empowerment, holidays, Nanny state, self reliance. Bookmark the permalink. Thank you for sharing. My bride’s family has kept the tradition of “Christmas stocking fruit” alive for three generations now as well. And I love Morongo Valley! I always enjoyed driving through Morongo Valley in later years… living there? Not so much. But I’ll probably never see it again since I moved to Wyoming and the “powers that be” seem determined to make it impossible for me to return to California. I won’t be molested and I won’t be disarmed. What a wonderful story. Thank you so much for sharing it. The simpler, yea poorer, times were better because we all truly appreciated the little that we received. The amount we have or don’t have is not really the deciding factor. Just remember that to the beggar in the streets of Calcutta, the poorest homeless bum in America is rich beyond their dreams. People choose their attitude and feelings in every situation. Some choose to be grateful and joyful, some choose to be bitter and hateful, rich or poor. I’ve seen plenty of both and everything in between. Wow. Thank you. Our Christmas stockings always had an Orange in the toe and a handful of nuts. My parents were born into the depression and then WWII so shortages were normal. They only time that had an orange was at Christmas and a few years that was all there was besides hand knitted socks or mittens. Even though citrus is now in plenty supply and relatively inexpensive, we carried the tradition on with our kids and now the grandkids.